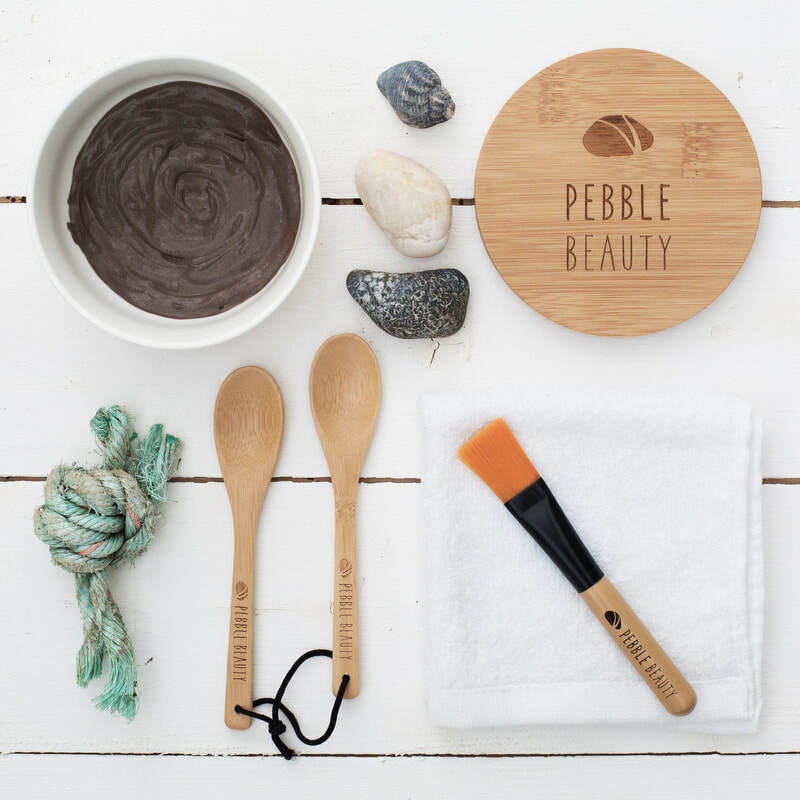 Your Pebble Beauty Face Mask kit comes with everything you need for 15 to 20 face masks, plus beautiful accessories that you can use again and again. Pebble Beauty Clay Mask #1. A unique blend of pure Moroccan Rhassoul clay blended with Hibiscus flower, Rosehip, Nettle leaf and Hawthorn berry powder. Reduces pore size, improves skin clarity and elasticity, firmness and overall texture. Anti-inflammatory, soothing and softening. Increases collagen production and reduces the appearance of wrinkles and spider veins. Pebble Beauty Botanicals #1 Hydrosol. This delicately scented hydrosol is made by steam distilling the finest natural organic ingredients. The resulting aromatic water retains many of the properties of the source plants. Each botanical in the blend imparts its own unique skin-enhancing benefits - softening, soothing, healing, detoxifying, tightening and rejuvenating. Ceramic bowl with bamboo lid. When mixing masks containing clay, it is recommended that you use an inert material such as ceramic because metals and most plastics can react with the mask, contaminating it and reducing its effectiveness. Use the bamboo lid if you have any mask left over and you want to store it in the refrigerator. Bamboo mixing spoons. As above, avoid using metal or plastic spoons when measuring and mixing your mask. Face mask brush. Using a brush to apply the mask makes it easier to get an even application and it's less messy than using your hands! Bamboo hair band. Use the hair band to keep your hair away from your face while you are applying and rinsing the mask. Bamboo face cloth. Bamboo fiber is naturally anti-microbial which is important for a face cloth as you don't want to be wiping your clean face with something that could be harboring germs! It's also beautifully soft, so it's suitable for all skin types. Rinse your bamboo cloth after every use, and wash once a week with a mild soap/detergent - use a cool wash to maintain the silky softness. Konjac sponge. A wonderfully gentle yet effective sponge for cleansing your face in preparation for your mask. See the page on caring for your konjac sponge for more information. ​Begin by holding your hair back with your bamboo fabric hairband. This will make it much easier to avoid getting your hair wet and messy! ​Using the ceramic bowl and bamboo spoons, either mix just enough for one mask, or mix extra and pop the lid on so you can keep any left-over mask in the refrigerator until you need it next. One mask will take between one and two spoonfuls, depending on how thick you like your mask to be. Alternatively, halve the quantities for a fabulous face scrub - great for when you don't have time to give yourself the full mask treatment. ​Next, prepare your skin using the charcoal-infused Konjac sponge provided. Your skin will be gently but thoroughly cleansed, so you’ll get the full benefit from the minerals and botanicals in the mask. You can find more information on using and caring for your konjac sponge here. ​Apply the mask with the mask brush, then lie back and relax while the 100% natural ingredients get to work. You should feel the mask starting to dry slightly on your face but there's no need to wait for it to dry out completely. Somewhere between five and ten minutes should be just right. ​After 5-10 minutes, use the naturally antibacterial bamboo face cloth to remove the mask and reveal soft, radiant skin. ​For added freshness and nourishment, spritz your cleansed face with Botanicals #1 hydrosol before applying your usual moisturizer if desired. Your face may be slightly red straight after you remove the mask but it will return to normal fairly quickly. If you do find that your skin takes a little longer than most (everyone's skin is different), you may prefer to use your mask in the evening as part of your night-time skincare routine. Use the mask once or twice a week depending on your skin type.